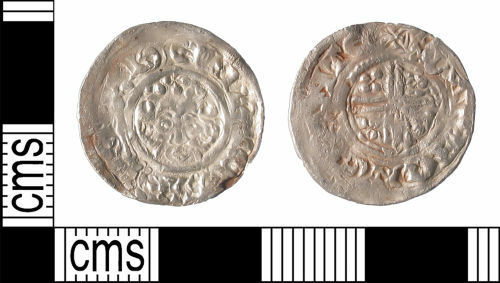 A silver medieval short-cross penny of Henry II to Henry III. Uncertain moneyer at Canterbury mint (AD 1180-1247). This penny appears to have been double-struck. Obverse description: Crowned bust facing with sceptre. Reverse description: Voided short cross with quatrefoil in each angle. An incomplete silver medieval cut short-cross halfpenny of Henry II to Henry III. Uncertain moneyer, probably Canterbury mint (AD 1180-1247). A silver medieval short cross penny of Henry II - Henry II, uncertain moneyer and mint (AD 1180-1247). This coin has been double struck. A silver medieval cut short-cross halfpenny of Henry II to Henry III. Uncertain moneyer at London mint (AD 1180-1247).